Cucumbers require a significant amount of heat and watering. Because of this ideally you would need a greenhouse if living in a cooler climate and lots of time to devote to watering. Both indoor and outdoor varieties available. Outdoor cucumbers tend to have a rough skin whilst the indoor variety have a far smoother skin. 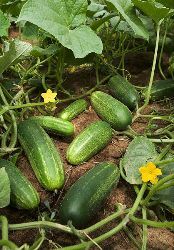 Cucumbers come in many varieties with both climbing and trailing varieties being available. The older varieties contain both male and female flowers. The male flowers are the flowers that do not have a fruit forming behind them. These male flowers have to be removed otherwise the cucumber is exceptionally bitter tasting. Modern cucumber varieties do not have male flowers but contain only female flowers so the problem is removed. Cucumbers are tender crops and should not be planted outside until early summer when the danger of frost has passed. For outside types, start seed off indoors in late spring in 3 inch pots, setting the seed on its side and covering with ¾ inch of soil. Greenhouse varieties can be started earlier. When the young plants are big enough, start hardening them off, finally planting them out in early summer. Plant your cucumbers into mounds , this is the same method used for courgettes and marrows, placing them at least 2 ft apart. Cucumbers have to be watered at least twice a week in summer. If not watered adequately the fruits will not develop properly. They will appreciate a feed with a liquid tomato feed or comfrey tea once a week when the fruits start to swell. Pick the fruits when they are 6 to 8 inches long. Cucumbers grown under glass are prone to red spider mite and powdery mildew. Red spider mite affects leaves, flecking them with yellow before they turn brown and die. 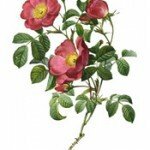 Keeping the greenhouse humid will help to control the problem. Powdery mildew is a fungal disease that can affect a wide range of crops, costing leaves and stems. Cucumber plants that are very dry around the roots are especially prone to this. All cucumbers can get mosaic virus, which causes the leaves to become mottled and yellowy. There is no cure, so affected plants need to be destroyed immediately. Indoor varieties of Cucumbers Carmen is an extremely heavy cropping and resistant to powdery mildew. 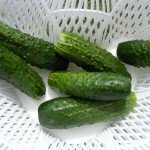 Outdoor varieties of cucumbers Burpless Tasty Green has a reasonably smooth skin with tender skin with good flavor and can be grown up a trellis.